Just finished a faceup commission for my friend, Marianne. This is the “Alice” sculpt from the Korean artist “Alice in Labyrinth.” Her sculpts have distinctive sweetness and sensuality. AIL makes a full doll in the MSD size, and sells some SD sized head sculpts as well. This SD Alice head is on a Dollstown 13 girl body. The head is white resin and the body is Fresh-Skin so the head needed a little extra color to match nicely. The head sits a smidge high on the neck but the aesthetic of this body with the head is really ideal. Sisters: AIL “Chloe” and AIL “Alice” together. 3. And lastly, Marianne wanted her painted to look mature — this sculpt usually looks quite childlike. Here is Alice, aka “Rose Red” all grown up. 20 Jun	This entry was published on June 20, 2013 at 5:11 pm. 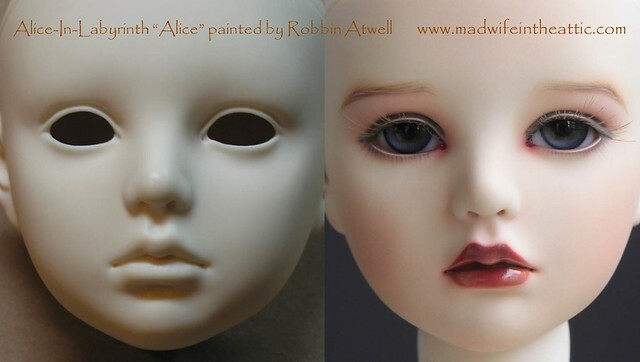 It’s filed under Doll Making and tagged ABJD, AIL, Alice, BJD, Commission, Doll, Dollstown, Faceup, OOAK, Painting, Robbin Atwell. Bookmark the permalink. Follow any comments here with the RSS feed for this post.